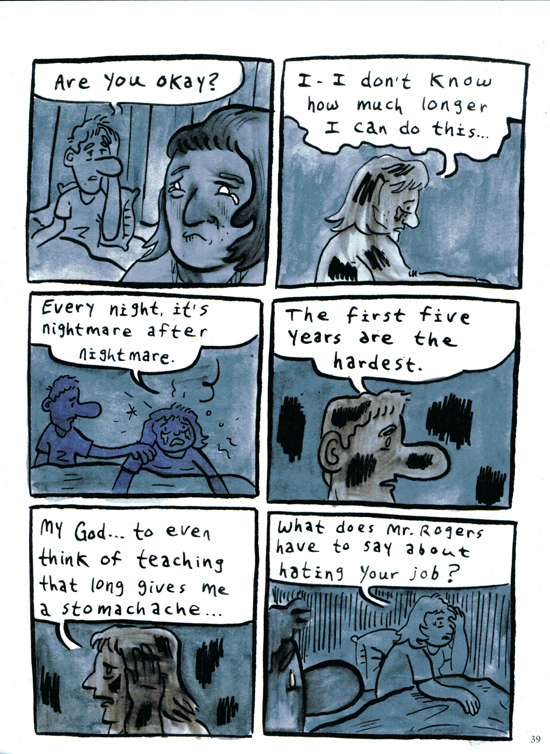 Comics is uniquely suited for any form of biography and to quite a fascinating degree. 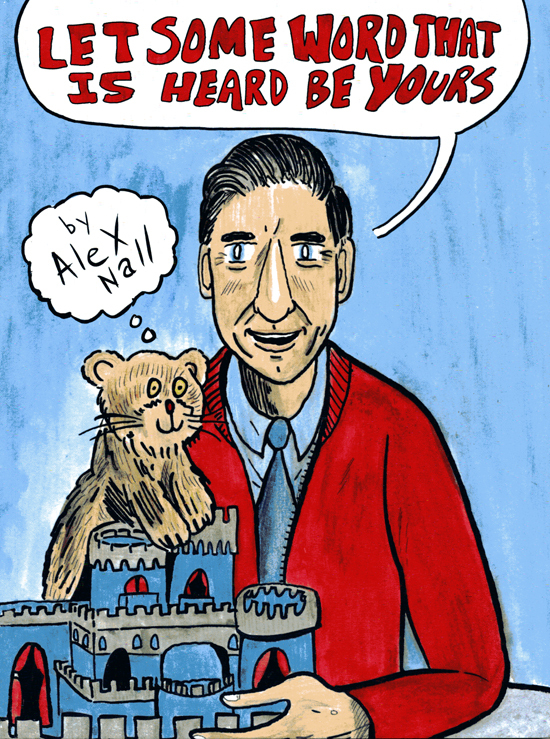 I’ve said that before and, to prove my point, I have all sorts of new things I can say about this theme in regards to Alex Nall‘s graphic novella, “Let Some Word That Is Heard Be Yours.” This is a look at the life and times of Fred Rogers (1928-2003), the host of the landmark PBS children’s program, “Mister Rogers’ Neighborhood.” Intertwined in this biography is a look at Nall’s own life as a grade school art teacher. 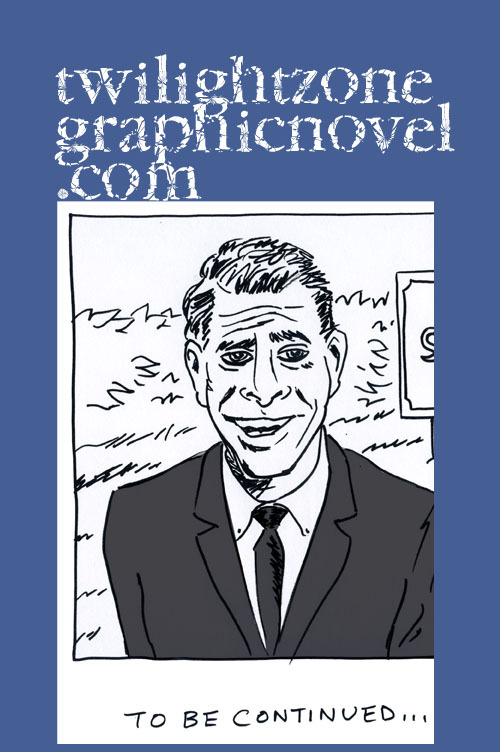 As often is the case, the comics creator has created a mashup of bio and auto-bio. It’s a natural occurance among cartoonists to include themselves into the narrative. When done right, the results can feel like a smooth dreamy story. A mashup of bio and autobio. Nall’s artwork has a primitive child-like quality about it. He depicts himsself with a cumbersome bulbous pink nose. 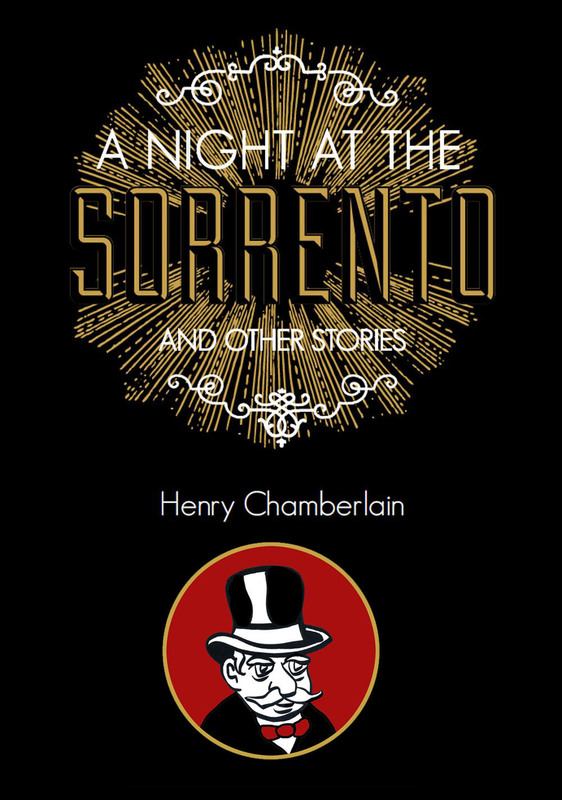 It is all hand-drawn, down to the lettering and color washes. This is a style that falls right in line with a lot of alt-comics: keep it simple; keep it slapdash. In this case, that look fits in. Nall evokes the frenetic energy of children: the good, the bad, and the ugly. Kids, the little angels we’d wish them to be, usually are far from saints. Time and again, Nall shares with the reader the reality of the daily grind of interacting with these wee people. Ah, big segue: Nall comes to find inspiration in his nightly revisits on his laptop to “Mister Rogers’ Neighborhood.” This triggers an exploration by Nall thus leading to confronting more than he bargained for. A young and feisty Fred Rogers. First, some words on Fred Rogers and his monumental achievement. Keep in mind, the “Mister Rogers’ Neighborhood” program ran from 1968 to 2001. There was nothing like it before and there will probably never be anything like it again. This is a show that speaks to kids on their own terms — and in a distinctive format that defies duplication. The viewership is mostly meant for 2 to 5 year-olds, but it appeals to any age. Fred Rogers became sort of a surrogate parent for countless children, spanning generations, simply by being there with kind and gentle entertainment mixed in with thoughtful observation and guidance. Everyone seems to fondly remember Fred Rogers and have a favorable opinion of him. 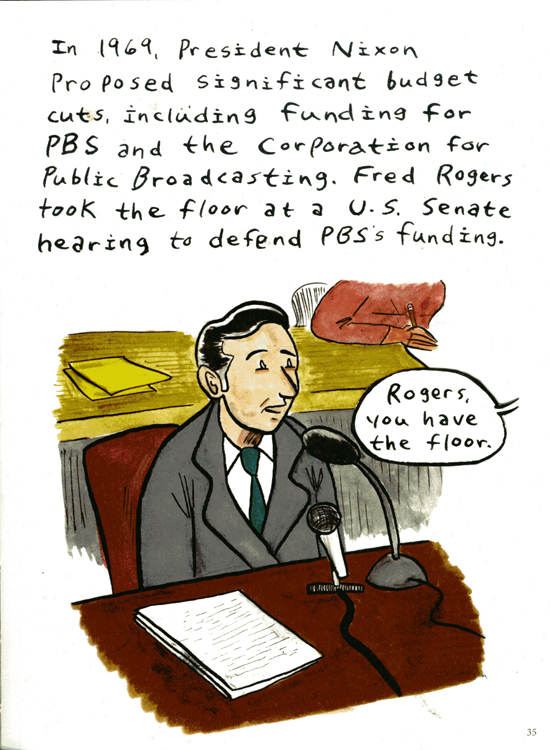 You may have seen footage of a young and feisty Rogers testifying before Congress in support of PBS funding. Rogers was able to melt the heart of at least one tough and jaded senator. Nall highlights a particular aspect in his story and provides an excellent example of how one element can affect the balance of the whole. Comics, with their panels and unique narrative structure, are inherently tricky balancing acts. You can include a scene in one panel and the ripple effect is under way. Refer back to it and the overriding subject behind it, and you’ve underscored it, boosted its significance. Return to the subject again, and the whole story points back to it, in a way, as if in service to that one aspect. These sort of shifts in focus happen all the time in big prose works. For example, a book on current events will have its most newsworthy items plucked for greater scrutiny by all the news outlets. Nall makes a strategic choice to focus upon the relationship between Mister Rogers and Police Officer Clemmons. The scenes are from the point of view of Francois Clemmons. Rogers hired Clemmons to play the role of a police officer on the show. 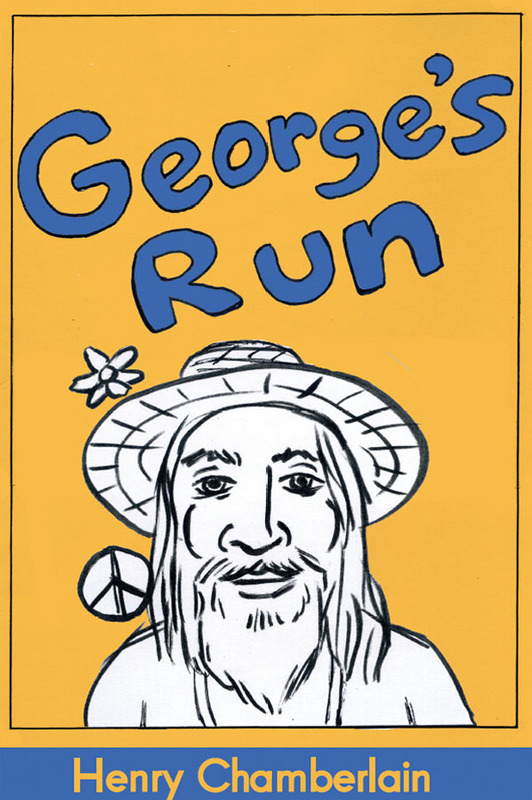 This was the late 1960s and police brutality was a hot news topic. In one particular panel, we see what looks like Mister Rogers washing the feet of Officer Clemmons. The unique nature of comics allows the reader to linger on a panel. The panel is already a highlighted moment, suspended in time, radiating beyond its borders. The actual moment that occurred on the show was held together by a very different medium. In the course of that scene with Clemmons, he and Rogers are indeed enjoying a moment of peace and quiet. As they are about to complete the scene, they both begin to get their feet out of the water. For a split second, Rogers takes a towel and passes it over Clemmons’s feet. It occurred so fast as to be subliminal. Certainly, it was packed with Christian symbolism. That moment, both subliminal and highly symbolic, is what Nall sort of plucked and focused upon to keep the reader wondering. It is unusual. Once you see it, you can’t unsee it. Sure, it is benign. You could see it as ideal too. But it is also unusual. It was Rogers’s way of gently and kindly getting a message across, specifically of racial tolerance but transcendent as well. A moment of kindness. Done. We move on. However, Nall has tapped into something that he pursues further and which he would be hard pressed to avoid. His research consisted of four articles and two books. It is really the one book, 2015’s “Peaceful Neighbor,” by Michael Long, that is at the crux of this. 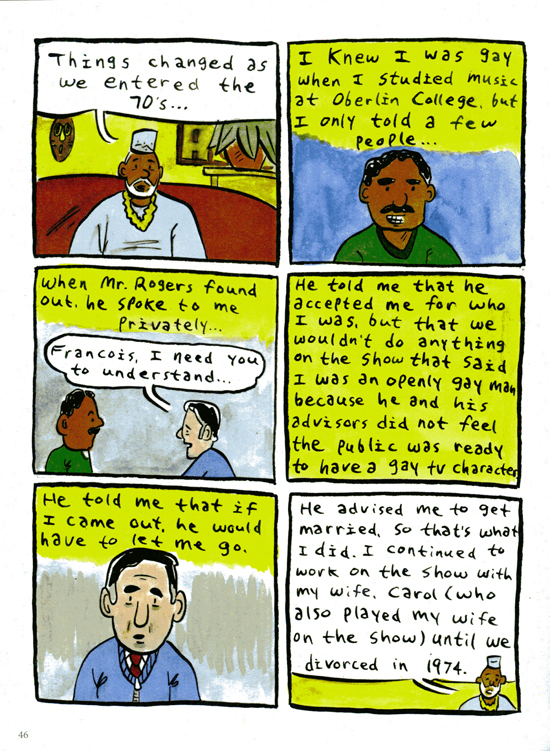 In the book, Francois Clemmons claims that he was told by Rogers that, while Rogers supported Clemmons coming out as gay, the program was not ready for an openly gay character. If he came out, he would have to be let go. To further complicate matters, Clemmons claims that Rogers advised him to marry a woman and Clemmons did just that. Considering the era, Clemmons would certainly not be alone among closeted gays. Even today, there is no openly gay character on a children’s program. Overall, Nall has done a good job in conveying some compelling facts. He is not bringing to light anything that was not already covered in “Peaceful Neighbor” but he has presented these facts in a different format and reached a number of new readers. Nall’s book is an achievement in the sense that any book of this kind put together by one individual is a small miracle in itself. So, yes, of course, I wholeheartedly congratulate Nall. It would be very interesting to chat with him on what parts of his book are style choices and what parts are simply the result of his current skill set. Personally, I am a strong believer in cartoonists perpetually pushing themselves to make the smoothest and most readable content. I look forward to what Nall does next as he considers his next project. Nall has demonstrated that he’s not afraid to tackle as ambitious a project as the life and times of Fred Rogers. And, as I say, he has a good grasp of how the comics medium works. It can be a deceptively simple affair but, in fact, it has quite a built-in complexity. Once the process is set in motion, just like any other creative endeavor, it takes on a life of its own. “Let Some Word That Is Heard Be Yours” is the latest installment of Nall’s “Teaching Comics” series. Visit him right here.